A brewery technician called out to fix a beer cooler at a Warwickshire pub got a bit more than he bargained for when, what he thought was algae, turned out to be a 5ft long snake. As reported by Birmingham Live, Paul Guild, 49, was called out to the New Swan pub in Atherstone to fix a faulty beer cooler. When he went to inspect the remote cooler in the pub’s cellar, he found the snake wrapped around a pump inside the water bath. Guild said: “I looked at the water bath inside the cooler and it looked like there was some green algae. “I gave it a pull and it moved! I jumped out of my skin, then thought I was seeing things. So I checked it with the torch on my phone and it was a snake. “I went upstairs to call our Health and Safety team to make a report – I think it is the first time anyone has reported a snake incident – it’s usually a mild electric shock, or getting covered in beer! Emma Campbell, 43, co-owner of the pub in question still isn’t sure how the snake got into the cooler. She said: “We did have a resident who had a corn snake, and he left weeks ago, so it could have been his. “But the animal welfare people who collected it said that it could have come in from outside – apparently they can slip in and out quite easily”. The snake was confirmed to be non-venomous and a corn snake. It’s not only in pubs where snakes are making a name for themselves. Earlier this year, a tiger snake was captured on camera as it completed a daring balancing act by slithering along the top wire of a fence at a Tasmanian vineyard. Meanwhile, in 2016, a disgruntled customer abandoned a 13ft python at a sushi restaurant in retribution after he was asked to leave by staff. 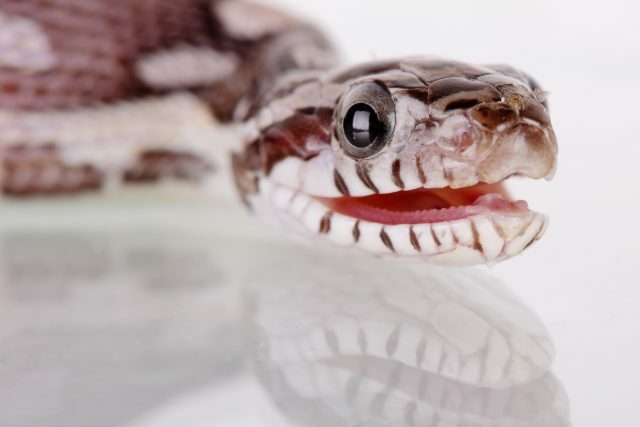 In a bizarre turn of events, in 2013, a woman in northern China had to receive hospital treatment after a snake preserved in rice wine jumped out of the bottle and bit her hand. Finally, in fake snake news, in the same year, a viral story about a python eating a drunk man in India has turned out to be a hoax as it was found that the snake in question was also accused of eating people in China, South Africa, Malaysia and Indonesia. Back in 2000 I was in a Taco Bell in Los Angeles when someone came in trying to sell a very large python. The staff were somewhat freaked out!